In interviews, more than 10 graduating seniors said they chose to live in D.C. after graduation to stay close to a network of alumni and professors who can help them secure internships or jobs. Now that graduates have received their degrees – nearly half will opt to live in the same bustling city where they spent their undergraduate careers. 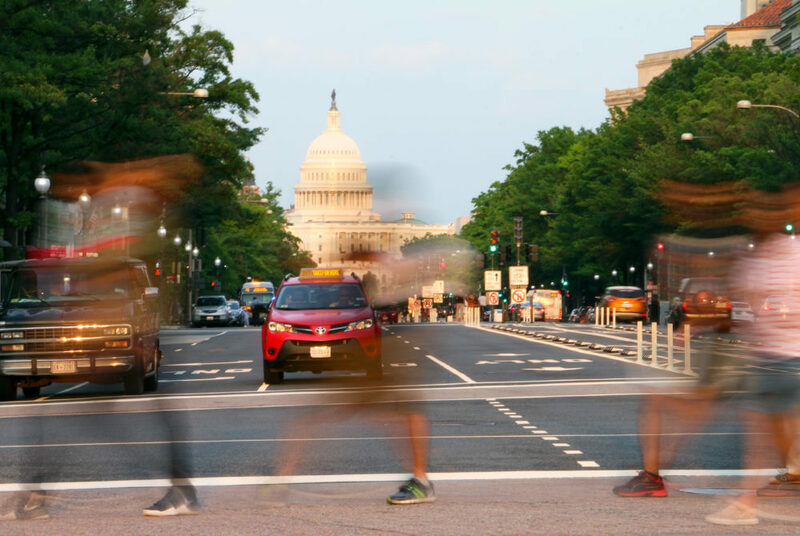 In interviews, more than 10 graduating seniors said they chose to live in D.C. after graduation to stay close to a network of alumni and professors who can help students secure internships or jobs in fields ranging from news media to politics. Career service experts said that as students leave college, a city is an easier location to work their connections with previous internships, alumni and professors to align themselves with career paths they want to pursue. Rachel Brown, the assistant provost for University Career Services, said deciding where to live after graduation is dependent on several factors, including the cost of living, career fields, job offers and where graduates’ families live. “There is no ‘one size fits all,’ and our career coaches enjoy working with students and alumni to help them identify and evaluate their options to help them thrive,” Brown said in an email. Still, nearly 40 percent of recent alumni remain in the District after graduation, according to data compiled by the Wall Street Journal published Tuesday. The rate is similar for some of GW’s D.C. peers, like Georgetown and Howard universities, which have about 37 and 41 percent of graduates staying in the District after graduation, according to the article. Of the 11 students interviewed, two students said they’re staying in the District to attend graduate school at Georgetown or GW. One student said she’s moving into a D.C. apartment to stay close to government departments until she can land a full-time job. Arthur Cronin, who graduated with the Class of 2018 Sunday, said he’s staying in D.C. for the summer to explore attractions, like museums and monuments, that he didn’t have time to visit as a full-time undergraduate student. Cronin, a biophysics major, said he’s moving to San Francisco but will likely return to the District after working as a semiconductor because his friends found jobs in D.C., and he has connections with professors he could use to find other work in his field. But for Devan Cole, who also graduated this weekend, it was numerous job opportunities covering national politics that made him stay in D.C.
Senior Kevin Kearns said living in D.C. would open more doors for him to decide between continuing education at a law school in the District or working for a law firm in D.C.
Career services experts said students often seek jobs in metropolitan areas because they’re able to dip into popular industries, like finance or real estate, in a place where there is room to advance to high-level positions using a network of alumni who have already begun working in the area. Pam Mulligan, the executive director of alumni engagement at Syracuse University, said recent alumni can more easily land jobs in cities, where “major networks” exist across all fields for students to explore – a perk that can only be found in urban areas. She said about one-third of all graduating seniors from Syracuse head to New York City. Syracuse offers networking events in New York City for recent graduates to communicate with alumni about internships and jobs in the area, Mulligan said. The University offers networking events, like happy hours, in the District to allow the roughly 90,000 alumni living in D.C. to connect with one another. Ali Rodriguez, the director of career services at the University of Miami, said students could travel to a city even if they don’t have a job secured because they’re able to jump between part-time jobs or internships in their field with hopes of finding a stable position. “Students are coming out and they have that fresh mindset, they’re adaptable, they come into an environment and they want to learn,” Rodriguez said. Kelly Hooper and Kate McCarthy contributed reporting.